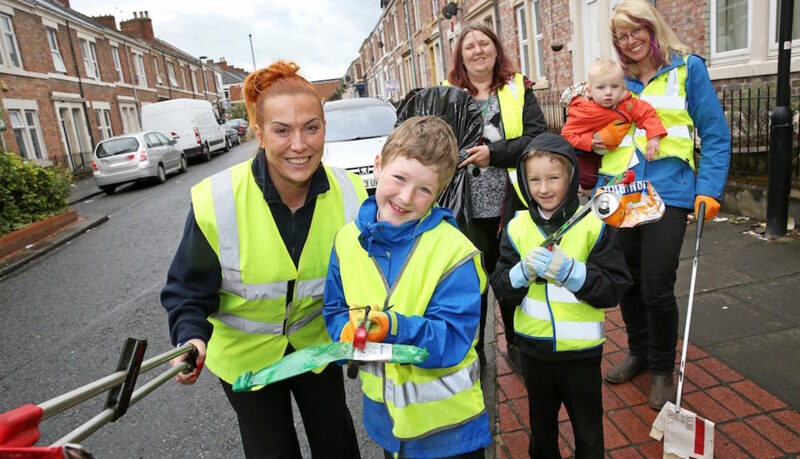 While most eight-year-olds are out playing in the sunshine or at home watching TV, you can guarantee Wilf Groves from the West End of Newcastle will be out helping to keep the streets clean and tidy. Wilf Groves and his mother, Sarah from Fenham, Newcastle Upon Tyne have been campaigning to encourage their local community to keep their neighbourhood clean by taking their rubbish home and putting it in the bin. He is so keen to improve the area, Wilf can regularly be seen picking up litter before and after his walk to and from school and has even started an anti-litter campaign at his school, Moorside Community Primary School in the Arthur’s Hill area of Newcastle. Wilf and his mother approached Greening Wingrove – a Community Interest Company (CIC) set up by residents to improve the Wingrove ward of the city. Karbon Homes donated £12,440 to the Greening Wingrove Community Improvement Programme last year to help them engage with local people, helping to educate them and improve their local community. Wilf is a shining example of the impact volunteering can have on a local community and in addition to his own school, he has presented in assemblies to over 500 pupils at neighbouring Westgate Hill Primary School and Wingrove Primary School to talk about litter and caring for the environment. During the assemblies, he discussed facts about recycling, the effects on nature and encouraged everyone to pick up litter and put it in bins when they are out and about. He has developed his own slogan, ‘We won’t put up with litter any more’ and has really engaged the local community with his enthusiasm and determination. As part of the Greening Wingrove Community Improvement Programme, weekly litter picks have been organised in the local area as well as monthly litter picks every third Saturday of the month, which has seen over 125 residents volunteering to keep their streets clean and to date they’ve collected over 270 bin-liner size bags of rubbish. As a regular volunteer, Wilf is also an active member of the Street Champion initiative where local people who regularly litter pick are rewarded with their own equipment. Melanie Rees, Community Involvement Officer at Karbon Homes, said: “Wilf is an excellent role model for volunteering and shows that you can volunteer regardless of what age you are. He really cares about his community and through him, many more people have joined in and also volunteered. Pictured left to right: Melanie Rees from Karbon Homes, Wilf Groves, Katrina Jordison from Greening Wingrove, Wilf’s younger brothers Ted (5), Bertie (1) and mother Sarah.